Moist heat cooking refers to various methods for cooking food with, or in, any type of liquid—whether it's steam, water, stock, wine or something else. Relative to dry-heat cooking methods, moist-heat cooking uses lower temperatures, anywhere from 140°F on the low end to a maximum of 212°F—which is as hot as water can get. With braising, the item to be cooked is first seared or sautéed, then partially covered with liquid and simmered slowly at a relatively low temperature. Braising can be done on the stovetop, but it's best done in the oven so that the heat will fully surround the pot, causing the food to cook more evenly than if it were only heated from below. Braising is a good technique for cooking tougher cuts of meat, such as those from older animals, or ones that naturally contain more connective tissues. These tissues are what can make these cuts of meat tough and chewy when improperly cooked. But the long, slow application of moist heat dissolves these tissues, with the result being a tender piece of meat. What's more, as the connective tissues break down, they dissolve and form gelatin, which thickens the cooking liquid and gives it body and shine. Meanwhile, braising causes the muscle fibers to absorb moisture from the cooking liquid and steam. That gives you a juicy piece of meat. Braising also melds flavors from the stock, vegetables and any herbs and seasonings. Poaching, simmering, and boiling are really three different stages of the same cooking method. Each of these methods describes cooking food by submerging it in hot water (or another waterlike liquid like stock). What defines each one is an approximate range of temperatures, which can be identified by observing how the water (or other cooking liquid) behaves. Poaching refers to cooking food in liquid that has a temperature ranging from 140°F to 180°F. Poaching is typically reserved for cooking very delicate items like eggs and fish. 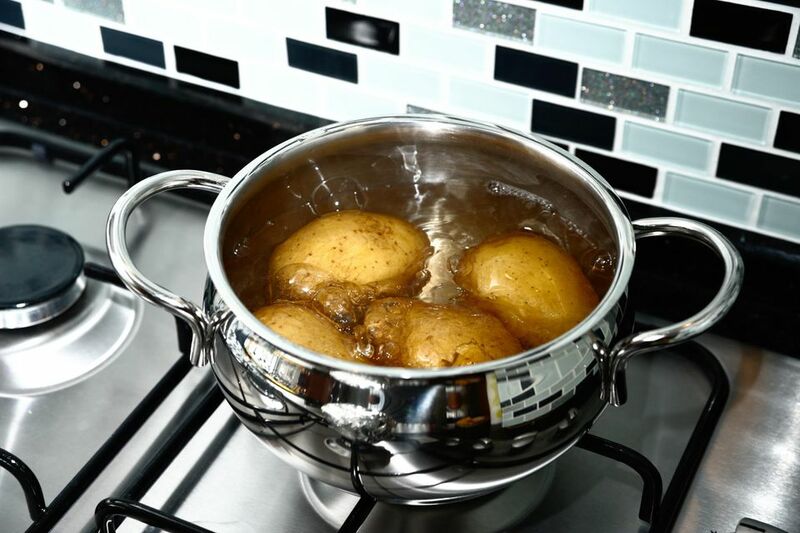 At poaching temperatures, the liquid won't be bubbling at all, though small bubbles may form at the bottom of the pot. Simmering is distinguished by cooking temperatures that are a bit hotter than with poaching—from 180°F to 205°F. Here we will see bubbles forming and gently rising to the surface of the water, but the water is not yet at a full rolling boil. Because it surrounds the food in water that stays at a fairly constant temperature, food that is simmered cooks very evenly. It's the standard method for preparing stocks and soups, starchy items such as potatoes or pasta, and many others. One of the downsides to simmering is that vitamins and other nutrients can be leached out of the food and into the cooking liquid. Boiling is the hottest of these three stages, where the water reaches its highest possible temperature of 212°F. It's actually the method that is least likely to be used in cooking. That's because the violent agitation caused by churning bubbles characteristic of a rolling boil will often damage the food. Boiling would be a bad choice for cooking an egg outside its shell, as when preparing poached eggs, because the agitation would basically destroy the egg. The same holds true for pasta and delicate fish. Once water is heated past the 212°F mark, it stops being water and turns into steam. As far as physical agitation goes, steaming is very gentle, making it ideal for cooking seafood and other delicate items. It also has the advantage of cooking quickly while avoiding the loss of nutrients through leaching. Interestingly, steam's maximum temperature is also 212°F, just like water. But unlike water, steam can be forced to exceed this natural temperature limit by pressurizing it. The higher the pressure, the hotter the steam becomes. Cooking with pressurized steam requires specialized equipment, though, so it's not something that a home cook would typically use.